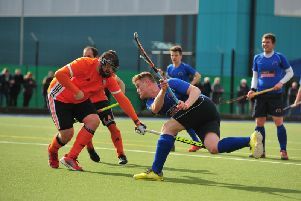 Harrogate Hockey Club Ladies 1s stormed back to winning ways with a 6-3 victory over local rivals York in North Division One. It was ‘Gate who led the charge in the first half with some beautiful, creative hockey. Their hard work in training focusing on goalscoring clearly paid off as within the first 15 minutes they had taken a 3-0 lead. Rachel Till’s side were rewarded for their attacking efforts with a short-corner from which Laura Beardsmore sent in a cross for Sarah Gibbins to deflect in front of the keeper into the back of the net. A second came shortly after, the first of four for player of the match Lucy Wood, who received the ball following some great play up the middle of the pitch by Tilly Hall and Becky Sagar, and placed the ball in the bottom corner. From this point, ‘Gate took full control of the game and continued to push forward. Wood extended the lead with a sensational reverse stick shot from the top of the D, before converting another from a short-corner with a disguised shot, which hit a York foot on the line before going in. Before half-time, ‘Gate managed to convert yet another short-corner when a strike from Evie Barnard was saved by the York keeper, but was expertly followed up on the rebound by Evelyn Wright. Despite a 5-0 scoreline there was still all to play for as York came back harder and stronger in the second half. Putting a very high press on the Harrogate defence, with some skilful players in their attack, the home side began their comeback. Keeper Caz Hurst made some impressive saves but a York attacker was able to get on the end of a cross to deflect the ball towards the goal and catch Hurst off balance. Shortly afterwards, the hosts registered a second chance with a powerful strike in to the bottom corner. This woke ‘Gate up and with hard work from all the team, they were able to get back on the front foot and break through the York press. It was almost goal number six for Megan Clark after a storming run forwards, but it wasn’t too be. York struck again at a short-corner after Hurst yet again made a fine initial save, but the York strikers were there for the rebound to take the scores to 5-3. With only five minutes left, ‘Gate secured their victory after putting pressure on the home defence to turnover the ball high up the pitch. It was Wood and Clark who broke fast with the lat sending the perfect ball through for Wood to deflect in the final goal of the game. This week the ladies have another local derby, this time against Adel, on home turf.